As the NATO Warsaw Summit looms (8-9 July), the positions of different NATO member governments are being carefully assessed by different players - inside and outside NATO - not least their perspectives towards greater NATO deterrence against a rearmed Russia, which war games exercises and various studies have confirmed could currently invade and hold the Baltic states within two to three days. 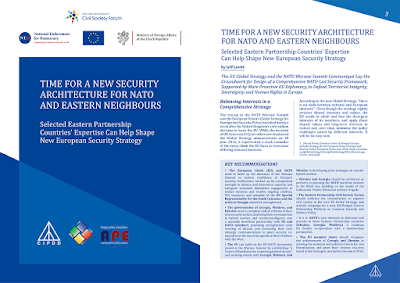 Some countries look to greater NATO-EU co-operation, primarily in intelligence sharing to counter and pre-empt hybrid warfare and cybersecurity. This, however, is more a question of who does the co-ordination, as the EU itself still lacks an intelligence-gathering agency, and the recently established East StratCom Task Force of the EU's diplomatic service (European External Action Service) remains only a small team working on monitoring Russian propaganda. 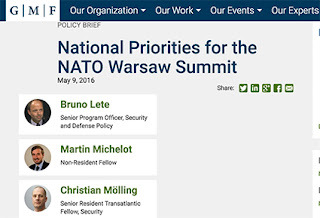 "France’s main priority at the Warsaw Summit is to maintain a balanced and flexible Alliance. This means that the French position on permanent presence is unambiguous: any deployment of NATO troops and capabilities beyond the agreed-upon Wales commitments would put the Alliance in a static posture that run counter to these priorities. This position reflects the desire of France to preserve its strategic autonomy and the ability to carry out its interests either via NATO or EU structures, something that an 'eastheavy' NATO would not favour. "Berlin’s military focus is toward conventional capabilities and reassurance measures on the Eastern flank [...] Berlin, Washington, and others agreed on a compromise formula of persistent enhanced forward presence, of multinational forces on rotation, and a command structure mainly offered by the host nation. The force size envisaged is also limited — about a brigade with contributions potentially no bigger than a battalion by each participating nation. These will rotate across the Baltic countries and Poland. This all builds on the trip-wire idea: not necessarily a high number of forces but the political message of joint engagement of all NATO members on NATO’s Eastern border is important." "NATO needs to shift its strategy toward an enhanced forward presence that would be in position and thus serve as a deterring and defending force [...] The forward presence is not about building big, Cold War style, permanent bases; it is about what Polish President Andrzej Duda described a few weeks ago at a seminar at GMF as 'intensive permanent rotation' and enhanced NATO’s infrastructure in the region [...] The United States has recently announced an additional heavy brigade to be rotated through the countries of the Eastern flank — European Allies need to do the same [...] A forward presence on the Eastern flank should be underpinned by better information, surveillance, and recognisance capabilities. This could be achieved by increasing AWACS flights in the region and creating a Forward Operating Base for Global Hawks in Poland [...] NATO also needs to begin to reopen the nuclear debate. Russia has developed a new doctrine that permits use of tactical nuclear weapons in a conventional conflict and is developing nuclear war-fighting capabilities, including low-yield nuclear weapons." "To address the militarisation of the Black Sea, Romania, together with Turkey, initiated the idea of a NATO Black Sea fleet to which Bulgaria, as well as NATO partners Georgia and Ukraine, would contribute [...] Top among the goals for the upcoming summit are NATO presence on the Eastern flank, an intensification of NATO exercises in the Black Sea — ideally leading to a Black Sea fleet — and closer co-operation with NATO partners in the region." "US policy will likely lean toward a less-costly approach than permanent structures and deployments [...] The United States will seek a more innovative, adaptive, and flexible Alliance that is able to deal with a full spectrum of threats."